Maricar Reyes could not help but reminisce her life as a medical student and as a doctor when she saw her diploma and certificates again. The actress found them while she was decluttering her home. “Saw this while decluttering with the husband. I had put these away till i found a more permanent place for them. #Memories #ReyesMD ay #PoonMD na pala 😉 #LuponNgMedisina,” she posted on her Instagram page. 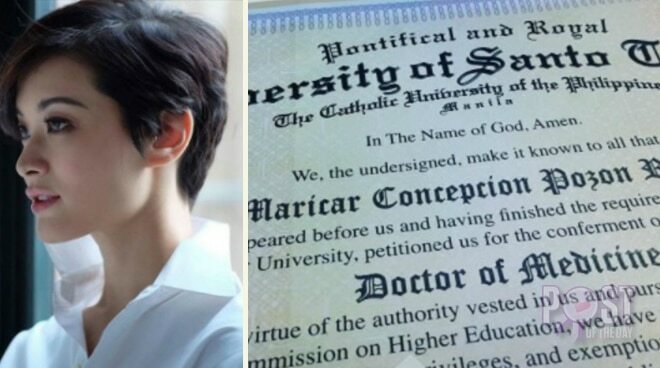 Maricar graduated from the University of Sto. Tomas with a degree in Medicine and successfully passed the board exam to be a physician. In an interview with Magandang Buhay recently, Maricar admitted though that she no longer wants to pursue a career as a doctor. "Ngayon ang tingin ko sa kanya, ayaw ko siyang pagkakitaan. Parang gusto kong mag-medical mission, mga ganyan. Pero as work? Parang baka hindi full-time job," Maricar said.